nextinformation overload March 18, 2015 10:42 a.m. If you consider Times Square an oversaturated assault on the senses today, you’re really going to want to stay away in the future. 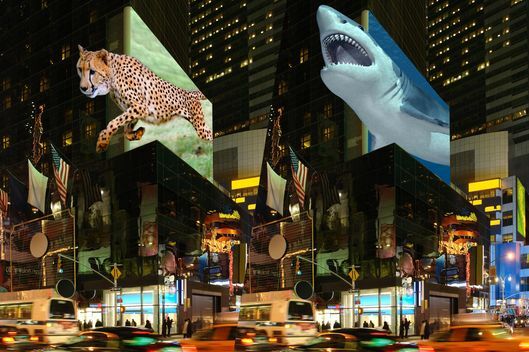 Especially if Vienna-based TriLite Technologies succeeds in making three-dimensional billboards a reality. Earlier this year, TriLite rolled out concept images of its glasses-free 3-D displays lighting up city centers, and it immediately conjured visions of Ridley Scott’s Los Angeles in Blade Runner and Robert Zemeckis’s Hill Valley in Back to the Future II. We recently spoke with TriLite’s founding partner Ferdinand Saint Julien to find out where the technology is today, where it’s going tomorrow, and ask the most important question: Why billboards? Your technology is being presented as 3-D without 3-D glasses, but that sounds deceptively simple. Does that accurately represent what you’re doing? Yes, it does. People don’t want to wear glasses and, especially in our setting — which is in Times Square, Las Vegas, Disney World, outdoors, for the masses — there is no point in having glasses because that means the passersby would need to have them. Speaking of the setting, why are billboards the ideal application for this? There are a lot of applications. The first that springs to mind is advertising billboards, i.e., Times Square. What we can do with this technology is not only 3-D without glasses. Imagine you’re standing ten meters away from me: You could see a different image than I’m seeing ten feet away from you. Imagine Times Square. You’re coming out of the Nike store and you can see a Nike advert, and I’m coming out of the Reebok store two houses down and I can see a Reebok advert [on the same billboard]. This seems like a good time to ask how your technology works. 3-D in effect means your left and right eye are getting slightly different images, and we can send one image to your left eye and one image to your right eye. With current LED technology, each pixel has a red, green, and blue LED and then a lens in front of that. We are not using LEDs. We are using laser diodes. The light emitting from the diodes is going through a lens and, after that, we’re placing a MEMS micro-mirror. We’re scanning the mirror on the horizontal axis, and that gives us the possibility of sweeping and showing different image information [to each eye]. Your first prototype was three-by-five pixels. How big is that really? What can you do with it? The first prototype was finished one and a half years ago, and it only had red lasers. It’s a proof of concept. This new one is able to show a different image to your left eye and your right. The second generation, with red, green, and blue lasers and improved mirrors, is a twelve-by-nine array. It’s probably the size of an A4 piece of paper. If you stack these up, you can get to whatever size you want to have. So after building this one, it’s a matter of logistics until these are out in the wild? It’s a matter of scaling. One module might sound small, but it’s basically going to be the final prototype that we’re building. We’re now looking for manufacturing to scale this thing. When people hear about this, they’re probably going to imagine really fantastic 3-D movies, but you’re focusing on advertising. Why? Our technology is daylight compatible. You can have full sunlight hit it, and you can still see a perfectly clear picture. That’s because we have such high brightness. In cinema, you don’t need high brightness. It would be too bright to work in a movie theater? It’s a cost issue. The first screens, because it’s new technology, are going to be very expensive. Over time, just like with LED technology, cost will come down, but the first screens are going to be in premium settings, like Times Square, Las Vegas, or Macau, places where money is not such an issue. What about viewer distance? That plays in, too, right? We have a viewing range of between 10 to 70 meters, and within that 10 to 70 meters, you can see the 3-D effect. If you come closer, just like with LED technology, you’re still able to see something, but you’re going to be able to see the individual pixels. If you stand further away than 70 meters, you only get a 2-D effect, which is the same as in real life, really. If you take mountains in the distance, you can only see them in 2-D. We’re kind of doing what nature is doing. Except you’re shining lasers in people’s eyes, which might freak them out. Have you encountered people who are scared of that? On a practical side, eye safety is not an issue. We are using very small and very low-power lasers. We were really excited to be using laser, because it’s a cool technology that James Bond uses. We thought it was really, really cool, and that’s the reason we highlighted it. The feedback that we’ve gotten from our PR launch is that people are afraid of lasers. We’re probably going to be reducing the amount we highlight the fact that our technology is based on lasers.